So begins Canada, the unforgettable story of a boy attempting to find grace, written by the only writer in history to win both the Pulitzer Prize and Pen/Faulkner Award for a single novel. This is the story of Dell Parsons, whose parents rob a bank and fracture his life into a before and an after, crossing the threshold that cannot be uncrossed. After his parents’ arrest and imprisonment, Del and Berner, his twin sister, face a blank future of foster care and social services visits. Berner, willful and burning with anger, runs away – orphaning Del completely. In the midst of his abandonment, a family friend intervenes, spiriting Del across the Montana/Saskatchewan border. There, in a dilapidated town floating in the sea of the Canadian prairie, he’s taken in by Arthur Remlinger – an enigmatic, charismatic man whose own past exists on the other side of a similarly uncrossable border. Undone by the calamity of his parents’ robbery, Del struggles under the vastness of the prairie sky and the stark, unforgiving landscape to realign his sense of self and his perception of the parents he thought he knew, even as he moves on an inexorable collision course with the slow-simmering violence trembling just beneath Arthur Remlinger’s cool reserve. A resonant and luminous masterwork of haunting and spectacular vision, CANADA is an elemental novel of boundaries traversed, innocence lost, and of the mysterious and powerful bonds of family. Told in spare, elegant prose but rich with emotional clarity, lyrical precision, and an acute sense of the grandeur of living, it is a masterpiece from one of the greatest American writers alive. 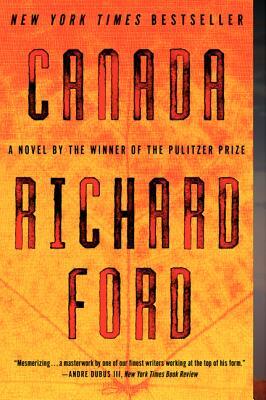 Richard Ford is the Pulitzer Prize-winning author of the Bascombe novels and the New York Times bestselling Canada and Let Me Be Frank with You. He is the author of the renowned short story collections Rock Springs and A Multitude of Sins. Ford is the 2016 recipient of the Asturias Award for Literature in Spain, and he lives in East Boothbay, Maine with his wife, Kristina Ford.